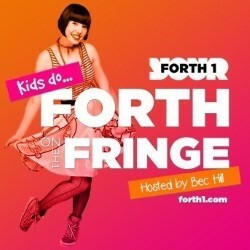 Performed in the Gilded Balloon’s Debating Hall, Kids do Forth on the Fringe showcases some of the best in this year’s children’s entertainment. Bec Hill is the host of this seventy-five-minute taster session, and she is as funny and entertaining as each of the acts. She was great at keeping the little ones engaged and had us singing and dancing between acts. On the morning we came along, there were six acts, each using their allotted ten minutes to its full potential. Amongst the six acts, we were lucky enough to see Trash Test Dummies, Children are Stinky and Arr we there yet. We had a singalong with Fun Box, and there was lots of participation throughout. The quality of the show will of course depend on the acts you see, which varies with every show. Those who like to plan ahead can check the line-up though on Radio Forth’s website. Off the back of this show, we booked a few others, having been impressed by their ten-minute performance. So, if you’re unsure of what to book, or have children with a limited attention span, I would highly recommend coming along to this show.